(CNN) – Trouble in paradise? Currently churning in Hawaii: weather woes, potentially two historic political blows and duels between Democrats - one of which pits President Obama's wish against a senator's deathbed request. As Hurricanes Iselle and Julio threatened to strike Hawaii with its first hurricane in 22 years – ultimately proving only to be a menace - political watchers eyed a storm of a different sort. Might Hawaii's incumbent governor and senator make history by losing in a primary for the first time in state history? On Saturday, voters in Hawaii set out to decide their fates and that of their opponents. 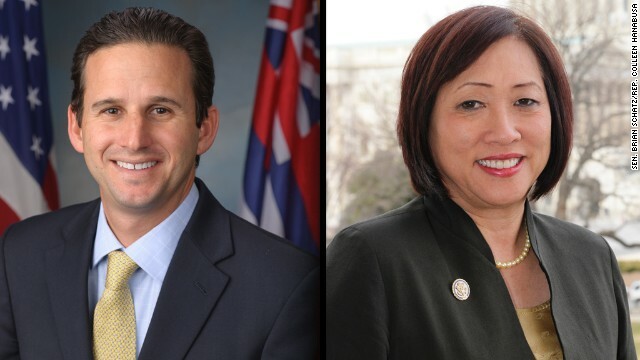 In the Senate race, Sen. Brian Schatz is running to keep his seat against Rep. Colleen Hanabusa. In 2012, Schatz was appointed to finish the term of the late Sen. Daniel Inouye. President Obama, in a rare move, has chosen sides in a Democratic primary, supporting Schatz's bid earlier this year. But the president's decision is at odds with the dying wish of the senator who Schatz succeeded. Days before his death in 2012, Inouye made clear he wanted Hanabusa to succeed him. Gov. Neil Abercrombie defied that request, instead appointing Schatz, then the lieutenant governor. Recent polls have shown a close race between Schatz and Hanabusa. Hanabusa has the support of Inouye's family and former Sen. Daniel Akaka of Hawaii. The race is a special election to fill the remainder of Inouye's term through 2016. Meanwhile, in the governor's race, Gov. Abercrombie is in danger of losing his party's primary amid a tough challenge from state Sen. David Ige. Though polls in Hawaii often differ from election results, recent surveys show Ige with double-digit leads over the governor. A recent Hawaii News Now/Star Advertiser Hawaii Poll showed Ige leading Abercrombie by 18-points. On the campaign trail, Abercrombie has touted his stewardship of Hawaii's strong economy, his record for creating jobs and his advancement of clean energy goals. In a campaign ad, the governor prominently features President Obama, who supports the governor's re-election. Yet for Ige, Hawaii is at a crossroads, in need of a strengthened and expanded state economy. Among the candidate's other political goals: provide more affordable housing and create better schools. In an ad titled, "Trust," Ige outlined for voters, "a choice between the same politicians who put special interests ahead of you, or someone you can trust." Ironically, the recent storm may help Abercrombie, giving him the opportunity to show leadership. Hawaii has long rewarded political incumbents. Since its statehood, no governor has ever lost in a primary in Hawaii. Additionally, the Honolulu Star-Advertiser notes "no incumbent U.S. senator – appointed or elected – has lost an election." Turnout – especially amid some storm damage – could be unpredictable in Saturday's primaries and will be key. Sen. Brian Schatz should be a gentleman ]and let it go . This is yet another issue with the term limits. These politicians stay in the same elected position so long that they think they own the seat. I know the senator has passed, but his seat was not an asset to be willed to whomever he wanted. It belongs to the people. For the second election in a row, the Dems' infighting is going to cost a major seat in Hawaii. These people live in paradise. Looks like that would put them in the mood to make an effort to bury their differences so at least one of the candidates would have a chance of winning come Nov.
Days before his death in 2012, Inouye made clear he wanted Hanabusa to succeed him. My how presumptive, how mafioso. These clowns get elected and stay there so long they think the seat belongs to them and that they can pick who gets it after they die. Is the Democrat Party a political party or a crime syndicate? My wish would be to rid dems of having wishes in some cases . But we all know what they say though . You can wish in one hand and ? Sad 0 that every time they come up with a dream it turns into a not very well thought out nightmare now days . Very immature and just plain late on reacting to obvious serious matters. This admin should be served a eviction notice by the ppl . Its not all his fault though . Albeit takes more than one dem to come up with these missteps bloopers and slipups for goodness sakes gee ? I find most of the news concerning Hamas and Israel to be somewhat skewed. I think it is important not only to give the casualty count in both Gaza and Israel, but to mention (and I have not heard this at all on CNN) that it is in Hamas's manifesto that it is their goal to kill all Jews and never recognize the State of Israel. This jis an important issue that is just not discussed enough on any news program. This may sound simplistic, but if Hamas obeyed the cease fires, and stopped firing rockets, their civilians would not be harmed, but as we know, showing bodies of children helps their campaign against the Jews. Be careful watch you wish for my friends is the moral of the story . We all got a toxin and expected a antidote . The effects are sickening. You ever get the gist that people just DONT CARE about the constant politics stuff?? You guys make big headlines about backwoods stuff so much that its crazy. A super earthquake can hit and MAYBE 1 person will report it. But any out of the way place or barely known has a DOZEN of your reporters climbing all over a sneeze. How about reporting on ACTUAL NEWS instead of some worthless politician after a free ride?? Democrats are at war with themselves. They are in the process of driving out all that are not far left progressive/communists/socialists. The party today is nothing like it was in the past. It is a far left progressive/communist/socialist party built on dividing Americans in any way they can, pitting one against another, while allowing our country to be invaded by millions of illegal aliens. JFK would NEVER be a Democrat in the far left party of today. Fidel Castro would be though! Democrats are at war with themselves. They are in the process of driving out all that are not far left progressive/communists/socialists. In the name of God ? -just vote straight democratic ticker. GOP further mess. Another Obama kick in the nuts- maybe people are FINALLY starting to wake up and realize what a disaster this man is and all he stands for same as this governor. Worst president since Carter and that speaks Volumes- but you get what you vote for and a community activist it is. Ideology and Ego over the reality of the world. @it must be said: you are deluded. The Dems have become a corporate centrist party, especially since Clinton dragged the party to the right in the 90s. Everything seems "far left" to you people. Name one policy from the last 20 years that is far-left. You can't, because there aren't any, except for in your mind. BWAHAHAHAHAHAHA!!!! Well, if I'm deluded, you are completely insane. "corporate centrist party"??? You are the only nut job out there that believes this. And pray tell, just how are they a "corporate centrist party"? They never meet a business or corporation they didn't want to tax and regulate out of business, with the exception of these green energy joke businesses that the Democrats use to funnel billions of dollars to their campaign contributors.